Good disease resistance with drought and frost tolerance. 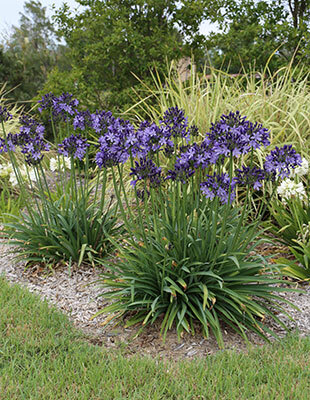 Description: Buccaneer™ Agapanthus has unique white with purple striped flowers on display sporadically throughout the year and en masse in spring and summer. 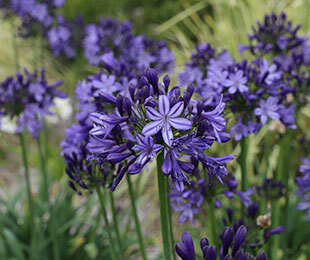 They flower for a longer period, with flowers typically repeating each season. A tough plant with drought and frost tolerance, along with good disease resistance. Size: 50cm high x 60cm wide; 60-80cm high flowers. Uses: Garden beds, borders, patio pots and planter boxes. Position: Full sun to part shade. Most soil types, but thrives in rich soils. Care: Water as required for 8-13 weeks until established. Plant in a well mulched garden (chunky mulch is recommended). If required use slow release fertiliser in spring. Remove older leaves and spent flower stems as required. Eligibility of this plant as a registerable plant variety under section 43(6) of the Plant Breeder’s Rights Act 1994 will expire on 5/3/2019.